Colored Denim: There's always room in your closet for a new pair of denim, especially when they're so cheerfully colored. I've been wanting a red pair for a while now, but those cobalt blue ones have me smitten! Breezy Blouses: Perfect for that effortless, chic look. Dress them up with a sleek pencil skirt or down with a pair of skinnies and flat. What trends are you looking forward to this Spring? What are your must-haves? I am looking forward to flowers. Im really into the floral prints right now, especially for tops, also another fav. of mine is Turquoise and coral. I think it's fitting for living in Florida. J. Crew can honestly do no wrong! I'm so glad that colored denim is still in cause I can't get enough and don't even get me started on statement necklaces. I NEED those pants now! Those colors....gahhh! 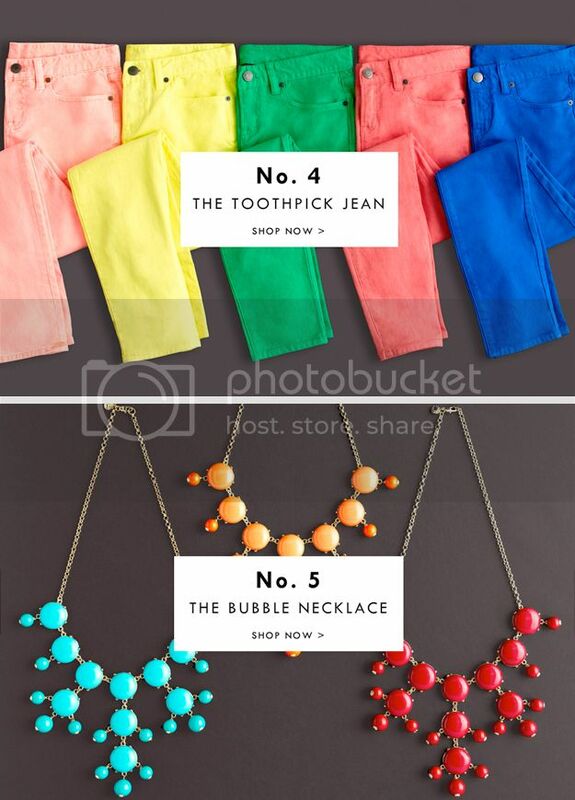 Pssst... you can get exact copies of the J.Crew bubble necklace on Etsy. I have a turquoise one and wear it all the time. :) It was $45 instead of $150. i really really want to get a pair of coral colored pants! i think they're adorable. while i was in vegas, i went to an outlet and found some and didn't get them and i have been regretting it ever since!! I have the JCrew catalog sitting right next to me...guess I need to check it out! LOVE all the vibrant colors!! I want Spring to be here now! oh that bubble necklace please! I was considering some kelly green skinny jeans from Nordstrom the other day. I desperately want a pair of sperry topsiders but my feet are always cold! I'm so in love with all of these! I really really WANT a pair of those coral jeans, love them! And the necklaces...so gorgeous!!! I have been eyeing up the bubble necklaces! Amazing. And the toothpick jeans are fantastic colors for spring. I love the colorful sperrys! It's cool how they're going with primary colors this season. J. Crew is the best. I LOVE LOVE LOVE J. Crew! I'm swooning over all of those pics right now. The 20 degree weather here has me really wanting spring right now! Oh how I love J. Crew! I need to get me some of those toothpick jeans. I already have cobalt blue, red, orange, and green jeans. Need mint green & pale pink! I generally don't shop j.crew but this post makes me think I need to swing by there more often. Super cute stuff!! Yes!!! I LOVE j.crew and I'm super excited to get me a fun pair of Sperry's for Spring! oh Jessica, you could keep going forever more with lovely j.crew bits and bobs. i adore just about everything from them and bubble necklace....OH OH OHHHHHHHHHHH how i love it!!! Oh yes. J.Crew makes me swoon each time I visit their website I leave a tiny bit poorer. I loved J Crew's spring line! 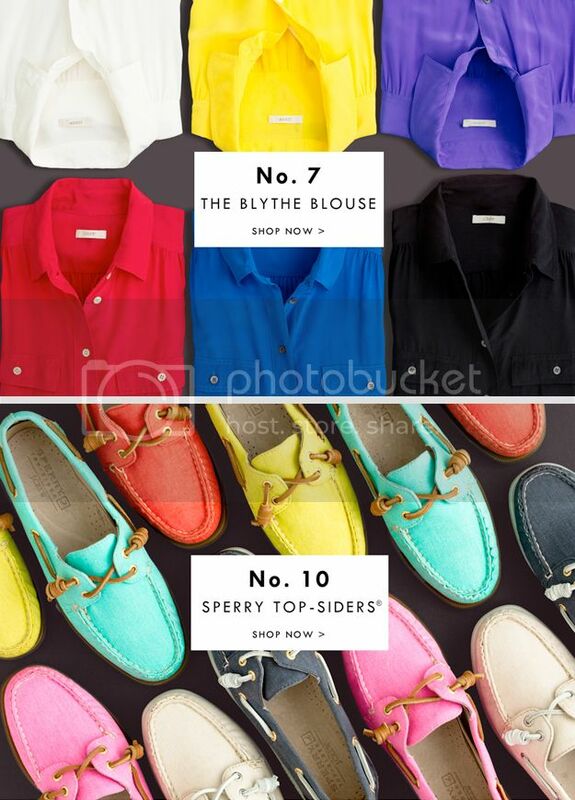 And I agreed with their 12 essentials, especially the breezy blouses and Sperry's! I am lovin' the toothpick jean. I can't wait for Spring to arrive! I LOVE that turquoise necklace!!! So perfect for the summer.